Lately I’ve noticed the craze in fashion for men which is not just the typical formal vest worn with slacks, but really a more casual vest, which in some cases is either lined with fur or with a hood. This trend is everywhere- I’ve seen it on people like Enrique Iglesias, Kid Cudi and even on actors in television shows. I think its hot because for a guy, instead of wearing a big coat or jacket out or dressing down with a pullover sweatshirt, you can hit it right in the middle with one of these vests. I’ve seen guys pull this look in both short and long sleeve shirts. It looks great with jeans or nice pants. The worst is when you’re going to a nice dinner or club. Obviously you’re not down to wear a cumber-bun or suit, but don’t want to look like you put in no effort with a zip down, so here’s where the vest comes in. You will not only look sharp, but it will show those around you that you have style and good taste. It’s amazing how far one item can go. In another case, say you’re in the mountains or where it is raining, throw on a sweatshirt or cardigan with this and I can guarantee the weather will not get the best of you. Of course, black is always the best route to go especially if you’re going to put down a few Jackson’s. I saw a few vests that were plaid which were nice, but just know that when you wear these, especially multiple times, people will know. Whereas if you pair up the black with different styles, it will be easier to fake a new look. Last but not least PLEASE, PLEASE, PLEASE do not wear a vest with a black and red checkered or plaid shirt. It is completely beyond me how one will leave the house not noticing that they look like a lumberjack. Do not pull this move if you do not live within a walking vicinity of snow and pine trees. 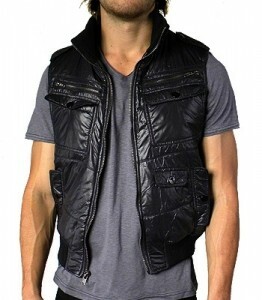 Below is the video by Enrique Iglesias “I like it” where he sports a really good looking black hoodie vest. Below are the resources to get yourself on this vest-alicious trending train. I have posted some great finds for all you’re spending brackets, so no excuses! The first is from Kitson. I really like this one because its manly, has a flare of fun and sports the trend well. But boys, don’t try and wear this one somewhere nice, you can pull it off in a club but you wouldn’t wear this on a date to Morton’s Steakhouse. 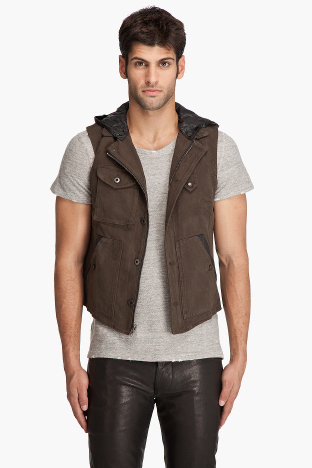 This vest below is from ssense fashion great paired with jeans. I have no idea what kind of pants those are that the model has on in this picture. Oh wait, no I do know that material- My friend just bought a tight skirt in it the other day. Don’t wear these pants boys, but rock the vest! 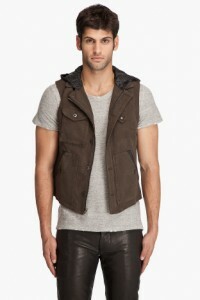 I LOVE this Armani vest for guys. If i were a guy this would be my pick. It just looks so comfortable and as you can see the model below has it on with a long sleeve shirt but can also be worn with a short sleeve as well. 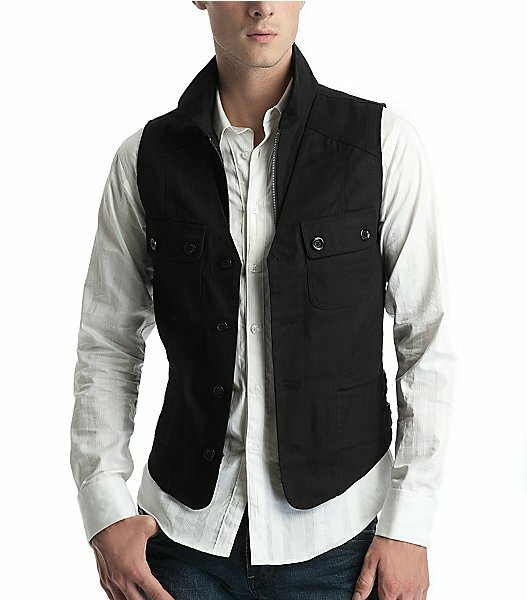 I think that these kinds of vest typically look better also with a V-neck rather than rounded neckline. 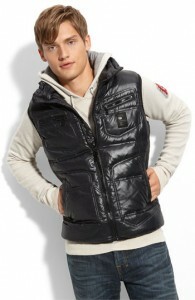 Definitely check out the Armani Exchange website because they have a few cool Fall vests. Last but not least, the Diesel was the first vest I actually spotted, but I had been looking for something a little less puffed and more sophisticated. This is an awesome vest, and I think this kind would look good on almost every guys body type. Short, tall, husky, thin, muscly, scrawny, you name it, I think any guy could rock this one. It also comes in an indigo-navy color for all you daring trendsetters. The vests are in, that’s for sure, not sure if my boyfriend will go outside the boring box! Thanks for the post, pictures help with men! I went shopping and to be honest the Nordstrom’s vest is a little puffy looking. However the vest from Guess is perfect and the material is really nice. Thanks so much for this post, you saved me the headache of trying to find one myself. SCORE!